Almost exactly two years later, O'Rourke fell roughly 220,000 votes short out of 8.3 million of unseating Cruz, closer to winning a statewide office than any Texas Democrat in a generation. The strength of his candidacy helped Texas Democrats pick up two U.S. House seats, two state Senate seats and a dozen state House seats. As political operatives processed election returns, the central question on their minds was this: Will Democrats build on this success, or was O'Rourke, the political landscape and the unique vulnerabilities of Cruz the equivalent of lightning in a bottle? “I’m assuming it’s not his last race, and I don’t know what he might decide to do, but it was a good reminder to everybody that the right combination of circumstances can make any race competitive,” Parker said Wednesday. As for Republicans, Cruz's narrow win was publicly hailed as a triumph over the tens of millions of dollars that poured into the state through O'Rourke's campaign. But behind the scenes Wednesday, more profound questions were being raised about what the outcome meant for the state's status as a GOP stronghold — and how Cruz, once heavily favored for re-election, managed to win by less than 3 percentage points. In an interview, Cruz's chief strategist, Jeff Roe, noted that it is sometimes forgotten that Texas is home to some of the biggest cities in the country — all of which now trend blue — and like elsewhere, the state's suburbs are in the midst of a political realignment under President Donald Trump. Add in the most talented and well-funded statewide candidate Texas Democrats have had in years, and the state's politics look a bit different. "They call it 'the ruby-red Texas' and all that," Roe said. "It's just not." Parker eventually met O’Rourke in an early 2017 secret meeting of current and former Democratic officeholders in Austin, some of them the closest thing the state party had to stars. There were the Castro brothers, both of whom were drawing speculation that they may take on Cruz and lead the party's most aggressive effort to turn the state blue in years. And there was Wendy Davis, who ran for governor in 2014 to much fanfare and lost in a landslide. The private gathering, just days after President Donald Trump's inauguration, came out of desperation rather than any real indication that Texas Democrats were in a position to move the ball forward in the midterms. “I was pretty damned depressed," said Dallas state Rep. Rafael Anchia, who was in the room. "The unthinkable happened." O’Rourke was one of the more obscure attendees at the meeting, a rank-and-file congressman from the most remote pocket of the state. In the El Pasoan, though, Parker saw a mixture of charisma, strategy and stamina. "We were all there, and that was when I met him, and that was when he started talking about running statewide," she recalled. The nomination would ultimately be O'Rourke's for the taking. Joaquin Castro, the San Antonio congressman, would announce that spring that he was opting to run for re-election to the U.S. House, weeks after O'Rourke officially launched his own Senate campaign. As for the incumbent, Cruz had kicked off his own bid for his U.S. Senate seat six years earlier in much the same position as O'Rourke was in — little known and widely underestimated. But now, the Houston Republican was universally known and coming off of a bruising landing from his 2016 presidential campaign. His uneasy relationship with President Donald Trump was a top source of gossip in Washington, but by early 2017, his re-election bid seemed to many on both sides of the aisle like a foregone conclusion. Washington Democratic strategists surveyed Texas' expensive media landscape at the launch of the O'Rourke campaign and suggested he would need to raise $50 million to even stand a chance — an inconceivable sum for someone with O'Rourke's profile at the time. National Democrats made clear early on that they would not be any help — focusing their efforts related to the Senate on a slew of incumbents up for re-election in states that Trump carried in 2016. Organizationally, O'Rourke was on his own. Win or lose, he seemed determined to look at how Democrats had run statewide campaigns in the past and, as often as possible, do the opposite of that. O'Rourke's longtime chief of staff, David Wysong, left the congressman's House office and took the lead on campaign strategy in Austin. Back in El Paso, O'Rourke chose a longtime friend and political novice, Jody Casey, to make the trains run on time as campaign manager. Until last year, she worked in sales at General Electric. Early on, O'Rourke defied the conventional wisdom in Washington and Austin over how to run a modern Senate campaign. He vowed to not hire a pollster or rely on consultants. “Since 1988, when Lloyd Bentsen won re-election to the Senate, Democrats have spent close to a billion dollars on consultants and pollsters and experts and campaign wizards and have performed terribly,” O'Rourke told the Tribune on the eve of his campaign kick-off in March 2017. Consultant fees on U.S. Senate races — particularly ones in states the size of Texas — can translate into multi-million dollar paydays. None of O'Rourke's closest advisers made more than $200,000, and they brushed off pitches from a number of the go-to Democratic hands. Republicans were quick to jump on campaign finance reports that showed O'Rourke hiring some outside vendors, but the congressman and his campaign maintained that they were only relying on third parties where it was necessary. The aim, he insisted, was to avoid outsiders providing strategic advice designed to calibrate his message. But the unorthodox approach didn't stop there. O'Rourke pledged to visit all 254 Texas counties, even as the vast majority of voters live in less than a dozen. He tapped a staffer to livestream on Facebook hours of his time on the campaign trail — not just speeches and town halls but also O'Rourke doing his laundry and skateboarding through a Whataburger parking lot. The goal was to introduce himself to Texans in a way that no candidate had ever tried. Slowly but surely, the crowds showing up at his events in virtually every corner of the state began to grow larger. Donations, most of them small but hundreds of thousands of them, began rolling in — with some supporters motivated in part by O'Rourke's emphatic refusal to accept money from PACs. 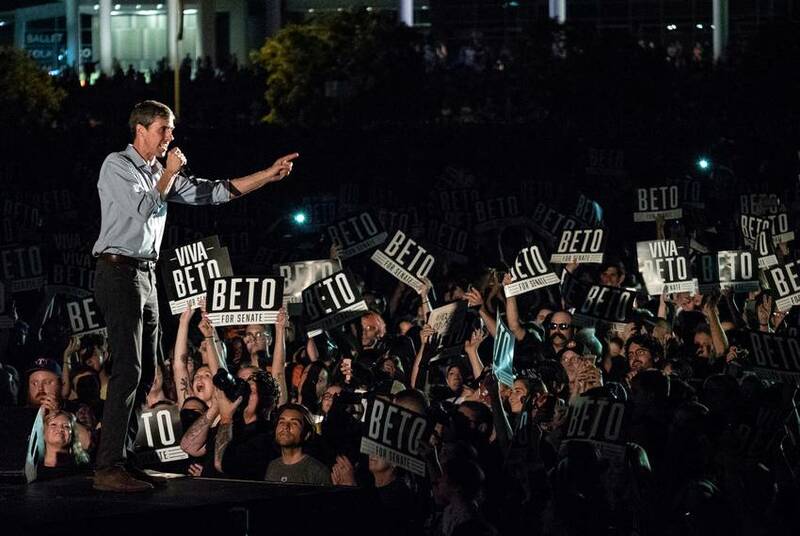 Along the way, O'Rourke's campaign grew to a scale few would have imagined from the outset. Wysong initially planned for a staff of 60 people. By Election Day, he had hired about 1,000. For the better part of a year, Cruz largely ignored O'Rourke as the Democrat crisscrossed the state working to visit all 254 counties. That abruptly changed on the night of the primary — March 6 — when Cruz convened Texas reporters on a conference call and let it rip on O'Rourke, blasting him as too liberal for Texas and ushering in a newly aggressive approach to the El Paso congressman. Cruz spent the ensuing months on the offensive, working to define a challenger who was still unknown to many voters statewide from the outset of the general election. 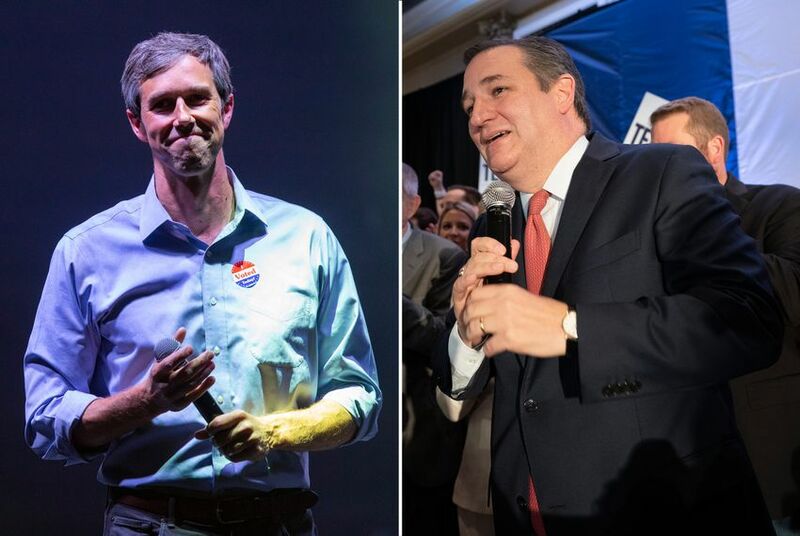 By the spring, polls began to show an increasingly competitive race, and O'Rourke's crowds were growing bigger and his fundraising more impressive — $10.4 million in the second quarter, or more than double Cruz's haul for the three-month period through June. "Up until July, it was very difficult for a lot of Republican activists, voters and certainly donors to believe that any Republican could have a hard time in the state of Texas," said Jason Johnson, a longtime Cruz strategist who worked for a super PAC supporting his re-election. "But I think what really changed that attitude or allowed people to open their eyes was that first giant fundraising quarter. That was definitely a pivot point at least from the perspective of folks, saying, 'OK, if for no other reason, the fact that this guy is getting so much money, we gotta take this serious.'" At the time, there was also growing anxiety among some Cruz loyalists — like the activists that powered his upstart 2012 campaign — about the state of his re-election bid. 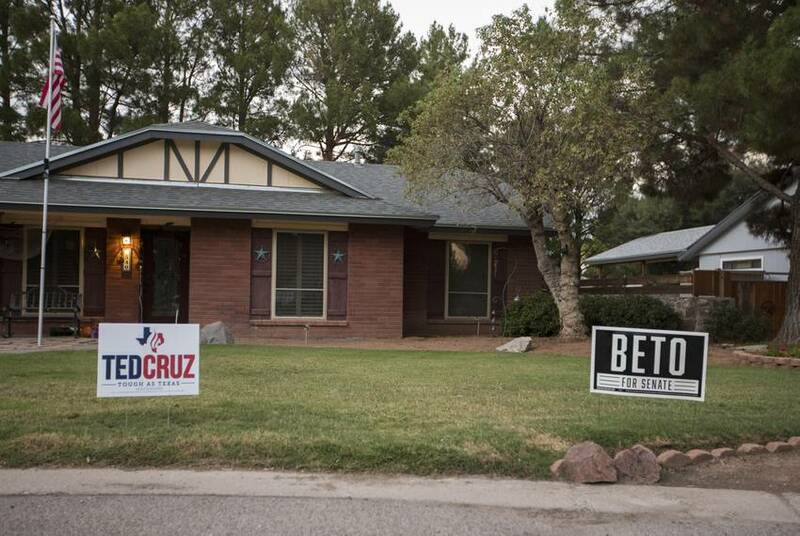 O'Rourke's yard signs were popping up all over their neighborhoods — where were Cruz's? O'Rourke had been crisscrossing the state for over a year — when would Cruz visit their town? By late summer, it was clear Cruz had a real fight on his hands, with some private GOP polling even finding the race within the margin of error. Both Johnson's group, Texans Are, and the Club for Growth, the national conservative organization that played a crucial role in Cruz's 2012 election, readied seven-figure TV ad blitzes. And some of the party's biggest names started making plans to visit the state, culminating with Trump's Aug. 31 tweet announcing he would hold an October rally for Cruz in the "biggest stadium in Texas we can find." Cruz, the runner-up for his party's presidential nomination just two years earlier and a heavy favorite for re-election just months ago, was in real trouble. Toward the end of a summer dominated by steadily growing, mostly glowing national attention on O'Rourke — countless national publications couldn't resist profiling the former punk rocker turned "Kennedy-esque" political phenom — the Democrat answered a question at a town hall in Houston that would elevate his national profile even further. What did he think of NFL players who kneel during the national anthem? Did he view such an act as disrespectful to veterans? "My short answer is no, I don't think it's disrespectful," O'Rourke replied, before delivering an eloquent overview of the struggle for civil rights in America, concluding that he could "think of nothing more American than to peacefully stand up, or take a knee, for your rights, anytime, anywhere, or any place." A video of the exchange from the progressive news aggregator NowThis reportedly racked up over 44 million views, earning O'Rourke glowing praise from athletes and landing him on "The Ellen DeGeneres Show." And ironically enough, it was Cruz's world that was responsible for that star-making moment — a person recruited by the campaign had asked the question at the Houston town hall. While national attention swirled around O'Rourke, the issue did not appear to be a political winner in Texas, where public polls showed that voters strongly disapproved of the anthem protests. Cruz's campaign moved quickly to put O'Rourke's viral comments in a TV ad, contrasting them with a veteran who lost two legs in the Vietnam War and who said in the commercial he cannot stand, but he expects others to do so for him. In Cruz’s internal data, O’Rourke had had a net positive image throughout the entire race until that point. 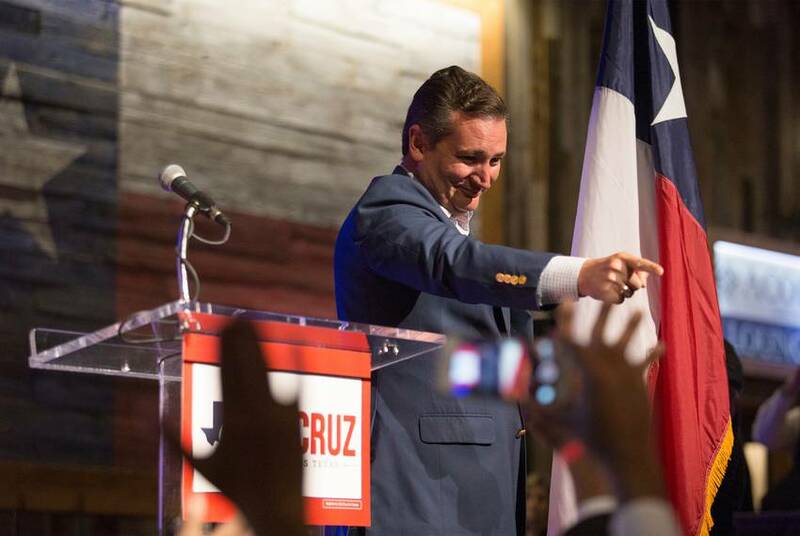 “He became the most unpopular statewide figure in Texas,” Cruz pollster Chris Wilson said. "I think it cut both ways," Wysong, O'Rourke's strategist, countered. "It certainly increased his name ID, which we had some concerns about, but it's a tough issue. It wasn't the top issue we were running on, but it showed who he was. He took a tough question, he was kind to the person who asked it, he gave background on why he disagreed, and he said it in a civil way." "The Cruz campaign got more than they bargained for," Wysong continued. "It costs millions to get that kind of name ID. That one thing was a huge turning point for certainly people knowing who he is and the kind of person he is." Soon after came the debates, the products of a grueling, months-long back and forth between the campaigns. Cruz's campaign viewed them as pivotal both at the time and in retrospect, believing they showcased the sharp policy differences between the two men after months of soft-focus national media coverage of O'Rourke and his 254-county barnstorm. Notably, the debates were bifurcated by the brutal battle over Brett Kavanaugh's nomination to the U.S. Supreme Court, which Cruz had a front row seat to as a member of the Senate Judiciary Committee. Kavanaugh's eventual confirmation, which came amid sexual assault allegations, energized red-state Republicans and helped give Cruz a desperately needed boost against O'Rourke, with Cruz's lead in his campaign's internal polling climbing into the low teens by the time they met for their Oct. 16 debate in San Antonio. It was at that debate that a new, more aggressive O'Rourke emerged. Fed up with weeks of attack ads targeting him — and getting pressure from supporters to get tougher with Cruz — O'Rourke amped up his rhetoric against the senator, even pushing back against his criticism at one point by dropping a reference to Trump's derogatory nickname for the senator during their 2016 battle: "Lyin' Ted." The strategy shift was punctuated the next morning, when O'Rourke began airing three TV ads against Cruz after weeks of running exclusively positive spots. Taken together, the developments tested a central tenet of O'Rourke's campaign — that he would take the high road and not run in opposition to anyone or anything. He contended that the commercials were cut from a different cloth than your typical negative spot — and they were, with O'Rourke speaking direct-to-camera about substantive differences between him and Cruz — but it was clear he was not entirely comfortable with the turn of events. 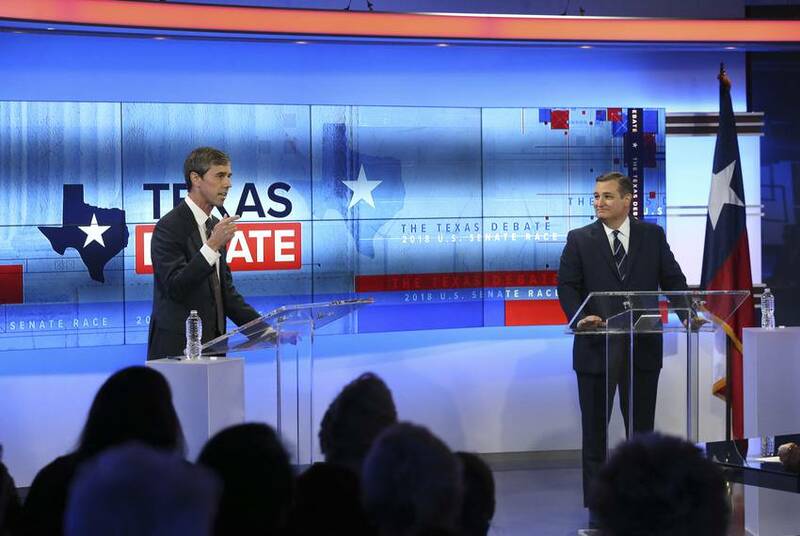 Two days after the debate, participating in a CNN town hall in McAllen, O’Rourke admitted he may have gone “a step too far” in his use of "Lyin' Ted." For all the animosity in the race's final weeks, one line of attack Cruz's campaign never deployed was O'Rourke's 1998 drunk-driving arrest, which received renewed attention after the Houston Chronicle revealed in August that police reports from the incident alleged that O’Rourke had tried to flee the scene. While the Republican Party of Texas and other allies made an issue out of the arrest — including a super PAC airing a last-minute ad on O’Rourke’s denial of the police reports — Cruz never raised it himself. While the odds were still stacked against him in Texas, O'Rourke had emerged as the hottest politician in the country. On Oct. 12, the campaign announced he had raised $38 million in the third quarter, the most a U.S. Senate candidate had ever taken in during such a period. With polls showing Cruz opening a more comfortable lead, the consensus in Washington was the race was over, as journalists, operatives and commentators began increasingly speaking of it in the past tense. Some began to question why O'Rourke was not sending some of his war chest to Democrats running for U.S. Senate in seats that were viewed as more winnable like North Dakota, Tennessee and Missouri. O’Rourke’s eventual margin was smaller than all of those races. Another Democratic anxiety was speculation that O'Rourke was preparing a presidential run, no matter the outcome of the Senate race, and he would pad that run with leftover Senate campaign money. O'Rourke campaign insiders tell the Tribune that they anticipate closing out the Senate campaign with nearly all of the money spent. Jose Borjon, the chief of staff to U.S. Rep. Vicente Gonzalez of McAllen, shook his head at the O'Rourke backlash. Borjon had taken leave from his job and relocated to South Texas to help with the O’Rourke effort. He knew O’Rourke's political skills in a way most other Texans did not: He worked against him as a staffer on now-former U.S. Rep. Silvestre Reyes’ 2012 re-election campaign. O’Rourke upset Reyes in that race, but it was particularly shocking to Borjon, who had seen a Reyes campaign internal poll showing O’Rourke down double digits in the homestretch of that race. Borjon walked away from that race with one clear worldview of O’Rourke: The congressman was a closer. Borjon was among a group of Texas Democrats who were quietly letting folks know in political circles in Texas and Washington that O'Rourke still had a shot at pulling off a historic upset. “I felt that if he had done it then, he could do it now,” Borjon said. And then O’Rourke began to close. Heading into the final month, it became clear the campaigns were on different tracks when it came to a critical task: getting out the vote. O'Rourke was building a massive in-house operation, complete with hundreds of paid staff, tens of thousands of volunteers and over 700 "pop-up offices" across the state from which those volunteers could phone bank and organize block walks. Much like the beginning of his campaign, O'Rourke stopped in places that a more traditional campaign might have passed on in those final days, like east Fort Worth, where the novelty of a nationally prominent candidate stopping by was not lost on African-American voters. "He would feel or hear from people that he was visiting, 'You haven't been here,' or 'Not enough of this community is represented at your events,' so we would try to make events more convenient to people that we were trying to attract," Wysong said. 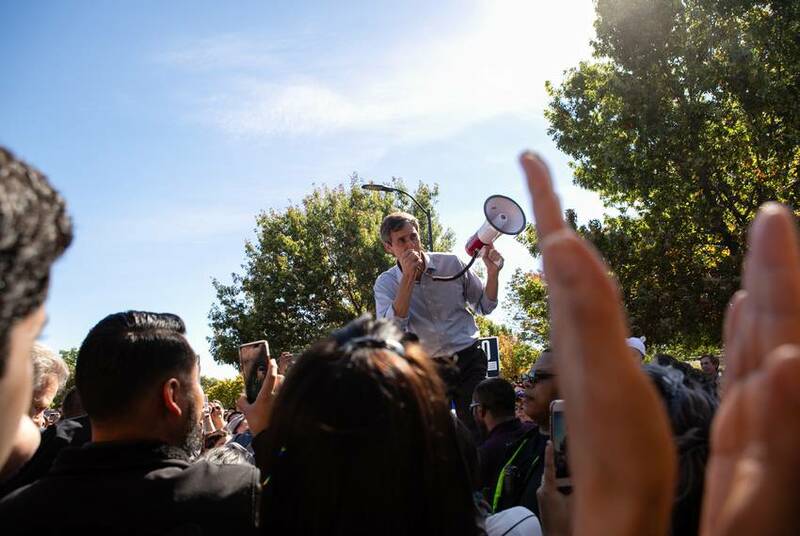 O'Rourke spent the final stretch of the campaign making multiple stops a day – sometimes in parking lots and parks that had little overhead cost – with a bullhorn in hand. The early voting stops were nearly always within walking distance of a voting location. The crowds at these events continued to grow even as his vocal chords began to give out. "We had to get a better bullhorn," Wysong said. Cruz, meanwhile, also hit the road during the period — going on a bus tour through Election Day — but had no comparable get-out-the-vote effort inside his campaign, and by all appearances, relied on the robust turnout machine created by another statewide official, Gov. Greg Abbott. Cruz even embraced the dynamic in the race's closing days, using a Texas Tribune article about it as a rallying cry. "There was a story that came out in the press a couple days ago — now our campaign has a total of 18 paid campaign staffers. Beto O'Rourke's campaign has 805," Cruz said at a Corpus Christi rally on the weekend before the election. "But let me tell you something right now — if you give me a choice between the millions from Hollywood liberals or the men and women of Texas, I'll take the men and women of Texas any day!" 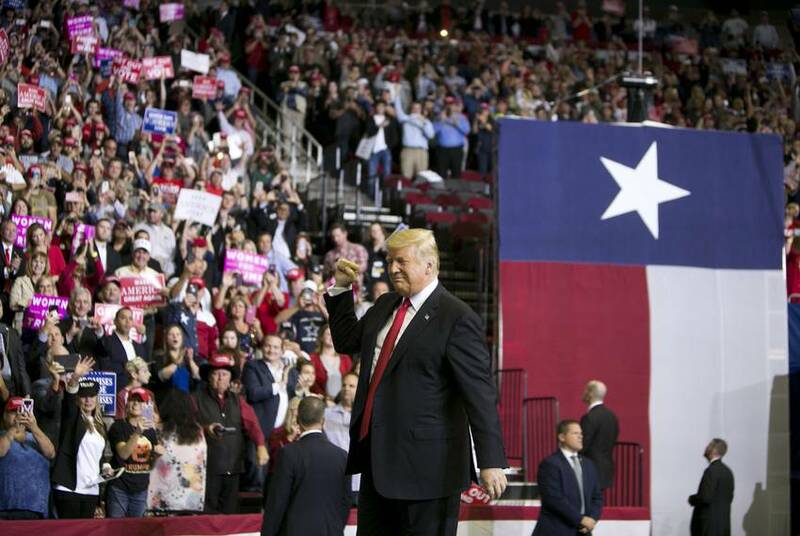 The early voting period kicked off Oct. 22 with Trump's rally for Cruz, which was held at the Toyota Center in Houston. Trump's campaign claimed over 100,000 people requested tickets for the event, and local news showed long lines of people waiting to get into the 18,000-seat arena hours in advance. But if Cruz was looking for a boost from his former rival, the opposite appeared to happen. Before Trump's visit, Cruz's internal numbers had him leading by double digits statewide. In the days after, his lead dropped to 5 points. Both sides were bracing for strong voter turnout but neither appeared to anticipate how big it would ultimately be. Over the summer, Cruz's team had projected that 5.8 million people would vote in the election, a projection it revised up to 6.1 million after the Kavanaugh hearings. Back in April, Texans Are had done some modeling that pegged "surge" turnout at over 6.8 million. As early voting shattered records for a midterm election, though, Republicans began to suspect they were entering uncharted territory, if only because there was no precedent for a midterm election in Texas. Heading into Election Day, Cruz's campaign had boosted their expectations for total turnout to top 7.6 million. Ultimately, over 8.3 million Texans, or 53 percent of voters, cast a ballot, making it the largest turnout for a midterm in recent history. In the days leading up to Election Day, well-regarded political insiders on both sides began to entertain a truly bizarre concept in modern Texas history: Could Beto win? As the early vote results began pouring in Tuesday evening, O'Rourke appeared to be running up the score in the biggest counties — walloping Cruz by a 2-to-1 margin in Dallas County, for example — while also outperforming in some suburban counties that have long been GOP-friendly. Shortly before 9 p.m., Roe took the stage at Cruz's election night party in Houston to try to assuage growing concerns about the early results, saying the campaign had anticipated Cruz having a narrow lead during the course of early voting. Wait for more rural counties to report their numbers, he advised. Roe was right, and over the next hour, Cruz's lead inched into the mid-single digits, networks called the race for him and the senator claimed victory, proclaiming a triumph over an "unprecedented" assault on the state from outside forces. When the dust settled the next day, Cruz had won by 2.7 percentage points, or roughly 222,000 out of the 8.3 million cast. Cruz's narrow margin was far short of ideal, and the down-ballot losses that came with it stung especially for some Texas Republicans who believe Cruz's campaign could have done more early on to keep O'Rourke from becoming a serious threat. "They could've killed this thing in the cradle if they wanted," one veteran Texas GOP operative vented. Cruz's campaign maintained that it took O'Rourke seriously and responded with discipline and efficiency as they were vastly outraised and outspent. They also believe they successfully staged the race exactly how they wanted. "Let it be about him," Roe said of O'Rourke. "From a paid ad standpoint, we wanted to make it a short race. ... We could not make this a long race, mainly because we didn't have the financial advantage." Another case that Cruz's advisers made in the wake of the election: O'Rourke never challenged them for GOP voters in a serious way. On that point, the record is less than straightforward: O'Rourke broadly appealed to Republicans through his 254-county blitz of the state, visiting GOP strongholds long neglected by Democrats and talking about issues he believed united both parties. "He consciously went for everybody," Wysong said. "It was a substantial part of his stump speech, but he also said what he believed. I think he was being honest to who he is. I think the way this was done was more of him just being honest and transparent about what he believes than, 'Oh wait, here was this little group I need to talk to in this way to get them excited.'" But beyond that, there indeed did not appear to be an explicit effort to win over Republicans who had soured on Cruz — a not insignificant group. In retrospect, there was at least one little-noticed development that may have been crucial: A wealthy independent candidate, Jonathan Jenkins, never made the ballot. He would have been an appealing option for Republicans dissatisfied with Cruz but not ready to vote for a Democrat, potentially siphoning GOP votes and proving decisive in such a close race. After missing the June filing deadline, Jenkins filed an election complaint alleging Cruz associates meddled in his petition drive, claims that have not yet been resolved. As for those on the O'Rourke side, the sense is that the campaign could, and probably should, profoundly shake up how Democratic candidates run in the future. A number of national candidates and operatives closely studied the O'Rourke campaign execution — the unconventional tactics, the low overhead and emphasis on authenticity — and have taken notice at how close he got on Tuesday. "The fact that he did things differently, and it was the closest race ... in decades, and he did it without the typical negative ads," Wysong said, "hopefully changes some of the trajectory of how things are done in the future." In the days after an election, those connected in any way to the losing side can often turn into a circular firing squad, quick to throw blame and I-told-you-so's at others. Yet Tuesday night and throughout Wednesday, prominent Democrats around the state were unenthusiastic — even privately — to criticize the O’Rourke campaign's execution. There were minor suggestions on how to improve on statewide campaigns in the future — that perhaps the 254-county strategy was misguided, that more needed to be done to appeal to Latino men, that O’Rourke should have hit Cruz sooner and harder. "I'm not a good second-guesser because I'm a big believer that choices have consequences," said Amber Mostyn, a prominent Houston Democratic donor. "So, if Beto had done something differently, as I would have advised, then there would be other consequences." "This election was clearly about work and not the wave," Mostyn said. "We have been doing intense work in Harris County for five cycles and you can see the results. Texas is headed in the right direction and Beto outperformed and proved that we are on the right trajectory to flip the state." Cruz and his campaign obviously maintain that O’Rourke was wrong for Texas — but that did not mean they were not impressed with the political talent displayed by the El Paso congressman. Roe said they watched him "grow as a candidate." Though O'Rourke has insisted for weeks that he has no interest in running for president in 2020, his name remains near the top of many such lists. Yet anyone speculating on his intentions is doing just that. On Tuesday night, he offered an open-ended farewell to supporters that undoubtedly kept hopes alive that he is not done with political life. “I am honored to have been able to do this with you, I am grateful forever,” O’Rourke said, “and we will see you out there down the road." Disclosure: Amber Mostyn has been a financial supporter of The Texas Tribune, a nonprofit, nonpartisan news organization that is funded in part by donations from members, foundations and corporate sponsors. Financial supporters play no role in the Tribune's journalism. Find a complete list of them here.